An original letter of correspondence between Joshua Coffin Chase and A. Q. Lancaster. Topics discussed include Lancaster's claim of unfair treatment from Chase's brother, Sydney Octavius Chase, and Lancaster's inability to work at Isleworth Grove due to poor health and his subsequent replacement. 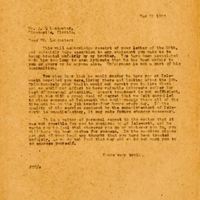 Original letter from Joshua Coffin Chase to A. Q. Lancaster, March 31, 1923: box 49, folder 20.84, Chase Collection (MS 14), Special and Area Studies Collections, George A. Smathers Libraries, University of Florida, Gainesville, Florida. Digital reproduction of original letter from Joshua Coffin Chase to A. Q. Lancaster, March 31, 1923. This will acknowledge receipt of your letter of the 28th, and certainly take exception to any statement you make to to being treated unfairly by my brother. You have been associated with him too long to even intimate that he has been unfair to you or yours or to anyone else. Unfairness is not a part of his composition. You also know that he would prefer to have you at Isleworth provided you were, living there and looking after the job. Unfortunately your health would not permit you to live there and we could not afford to have valuable interests suffer for lack of personal attention. Absent treatment is not sufficient, and it was with a great deal of regret that we felt compelled to place someone at Isleworth who would remain there all of the time and be on the job twenty-four hours every day. If the quality of the service rendered by the superintendent of Isleworth is unsatisfactory, it may make future changes necessary. It is a matter of personal regret to the writer that it was not possible for you to continue on at Isleworth, and he wants you to feel that wherever you go or whatever you do, you will have his best wishes for success. In the meantime please get out of your head any thought that you have been treated unfairly, as we do not feel that way and we do not want you to so express yourself. Chase, Joshua Coffin. 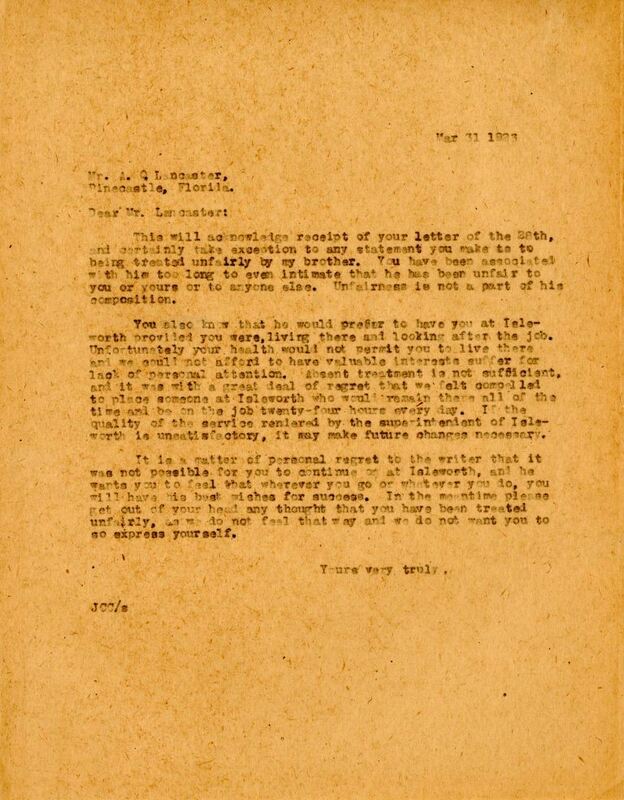 “Letter from Joshua Coffin Chase to A. Q. Lancaster (March 31, 1923).” RICHES of Central Florida accessed April 18, 2019, https://richesmi.cah.ucf.edu/omeka/items/show/2698.